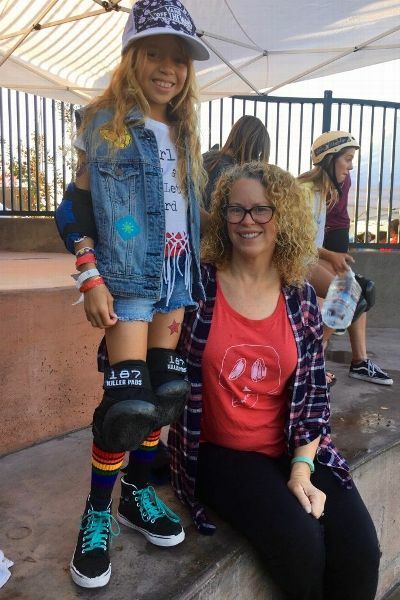 Exposure Skate 2016 is the largest female skateboarding event in the world -- and this year, featured competitors age 4 to 40. Minna Stess, 10, won her age group in bowl, took third in vert and placed fourth in street. ENCINITAS, California -- A row of girls in hot-pink helmets huddle around the bowl at Encinitas Community Park. With skateboards in hand, they know they can do anything. "I feel free," 11-year-old competitor Stella Reynolds says before her heat. There are competitors between the ages of 4 and 40, donning turquoise helmets, carrying neon-orange skateboards, wearing shirts that say "Boss" and "Fearless." With the bowl, vert and street courses their canvas and the tricks their paint, these girls and women ripped from morning to sunset. Welcome to Exposure Skate 2016, the premier female skateboarding event in the world, held in Southern California each November since 2012. This year's competition featured 171 amateurs and pros from all over the world, competing on three types of courses: vert, bowl and street. Vert, short for vertical ramp, is similar in many ways to a snowboard halfpipe, and the "bowl" is just what it sounds like -- a giant bowl that skaters stay inside. Street involves tricks in public spaces like down stairs and on railings. At this year's event, the parking lot was already jammed by 8 a.m. 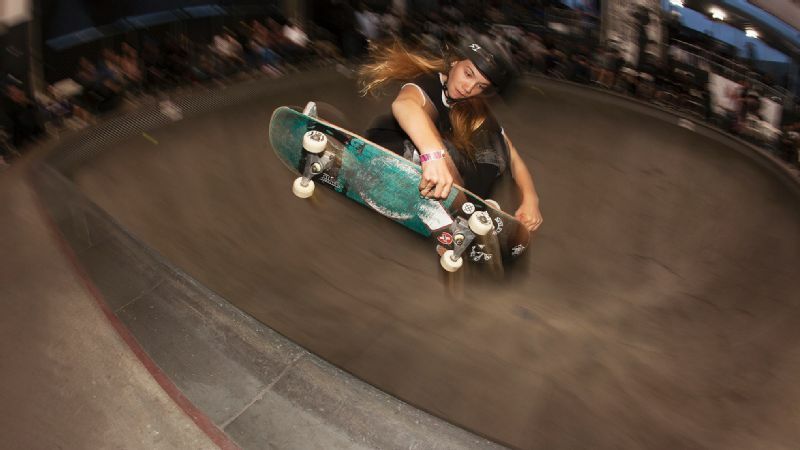 Girls and women go to compete -- but also hope to get a glimpse of pros like Lizzie Armanto, Brighton Zeuner and Lacey Baker. "This is the competition that, if you're a girl, you have to be here. This is it. There is no bigger competition," said Hagan McCreath, 40, of Monster Skatepark in Sydney, Australia, who also served as an emcee at Exposure. 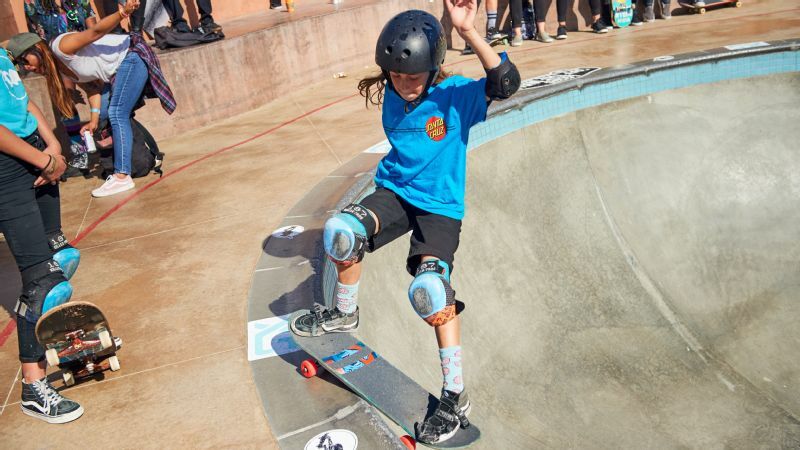 Amelia Brodka couldn't have pictured this scene when she co-founded the nonprofit organization Exposure Skate, dedicated to empowering girls and women in skateboarding. The idea came after she directed the documentary "Underexposed," which highlighted the lack of opportunities for female skateboarders. Exposure the event was born in 2012, with proceeds going toward helping survivors of domestic violence. "It feels like a community, it feels like a family out here," Brodka said. "These women want to see the sport grow and they want to support all the other girls." There were winners, like Zeuner, age 12, in pro bowl; Armanto, 23, in pro vert; and Alexis Sablone, 30, in pro street. But skateboarding veteran Dave Duncan, emceeing the event, reminded the crowd of something equally important: "It doesn't matter if you win or lose. If you're having a good day, if you're having fun, that's what skateboarding's all about." What does this event mean to the girls and women who compete each year? We talked to seven of them to find out. Quinne wouldn't stop smiling, even as her mother, Julie, placed a bandage on her bloody knee from a recent skateboard fall. With a temporary, red star tattoo on her other thigh, rainbow socks, turquoise laces and a "Girl is not a 4 letter word" shirt, Quinne was ready to ride in the amateur 14-and-under bowl. She has been skating for a year and a half. Her mother suggested she try the sport since she had mastered her scooter. Soon, she attended her first skateboarding camp. "I dropped in my first day," Quinne said, beaming. "It felt pretty awesome." This was her first time competing at Exposure, though she attended the event last year with her mother. "She saw other girls competing and she was just google-eyed," Julie said. "We were going to come back again as spectators, but she was asked to compete. She had so much fun!" 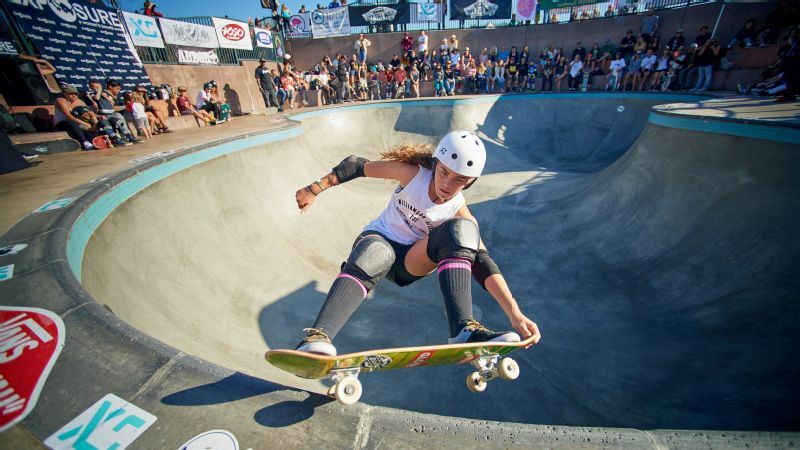 Jordyn Barratt has racked up numerous skateboarding medals, including first place at the 2016 Girls Combi Classic in the 15-and-over amateurs division, and third at this year's X Games in Austin, Texas, in women's skateboard park. But Exposure provides something equally special for her: "Everyone is empowering each other to land a trick," Barratt said. "It's not like, 'Dang she landed it.' It's like, 'Yeah! She landed it! That's so rad!'" "Winning is always a fun thing to do and being competitive is super fun," said Barratt, who took second in both the pro bowl and vert competitions, "but hanging out with your friends at a skate park and pushing each other to do a trick, finally getting that trick and being so stoked for each other, knowing how hard it is -- no matter if you're an older guy or a young little girl -- we're all here supporting each other." Stephanie Allen double-checked with Exposure to make sure she was the oldest competitor. "By a long shot," Allen said, proudly, as her cheetah elbow and knee pads and her lime-green board glimmered in the sun. "It's been a journey," said Allen, who began skating last year. She had been sick for the past nine years, and extremely ill for the past two. That's when she was diagnosed with a rare blood disorder, hypogammaglobulinemia. She was barred from surfing due to monthly blood plasma transfusions, which left her immune system unable to fight off the germs and bacteria in the ocean. "I was like, 'That's it. I'm going to learn how to skate. I don't care that I'm 39!" Allen said. "To me, this is kind of a rebirth. This is showing me that life can really turn around," said Allen, who said she feels healthier than ever. "For me to just be here and celebrate being alive and healthy and being able to skate, I'm amped. Skateboarding saved my soul." Simpson followed Exposure veterans on Instagram over the past few years. She aspired to come to the United States and compete, practicing daily on a bowl at the end of the block of her Sydney home. "I'm used to competing against two girls at the most, maybe three," Simpson said. "It's so good when you go to a skate park and the guys will be like, 'What are you doing here? What's a girl doing here?' Then you start skating and they see that girls can skate too." Simpson no longer feels like an outsider. 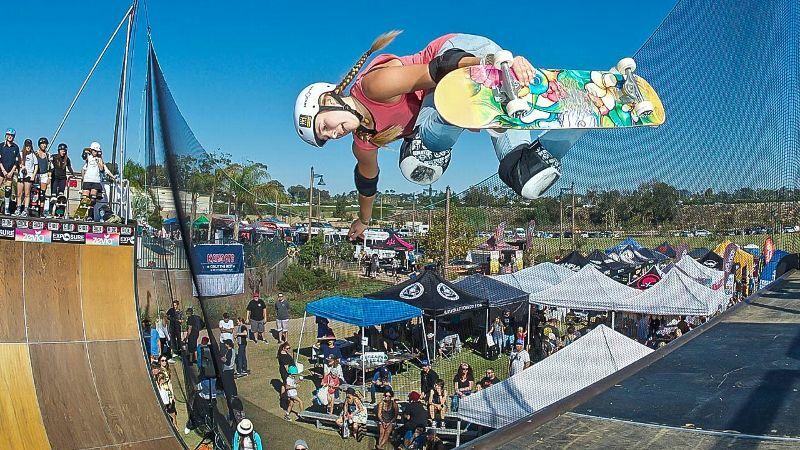 Exposure allowed her to meet new friends and push her skills to a new level, as she took first in the amateur 15-and-over vert and third in the amateur 15-and-over bowl. "To compete against this many girls, has been so much fun," Simpson said. "It's been a dream seeing all these girls who love skateboarding like I do." 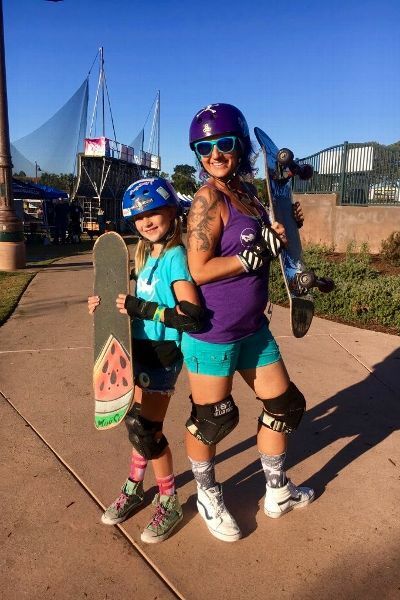 Though Sebelius and Kelsay are 28 years apart, the two friends share a love of skateboarding. They also happen to share the same birthday -- on the day of Exposure -- where they both competed in bowl. "It was meant to be," said Sebelius, taking off her purple helmet, recalling how the two met at Alga Norte Community Park in nearby Carlsbad. Sebelius originally frequented skate parks to follow her crush, a skater boy. Then, she grew tired of watching. She wanted to drop in, despite her fear of heights. "Skateboarding has taught me perspective, patience and persistence," Sebelius said. "You have to keep going." Kelsay, who has watermelon grip tape spray-painted on her skateboard, started skating a year ago after it was getting too cold to surf. She loved the challenge. "It helps prove that girls can do the same things that boys can do," Kelsay said. The pair often practices together. "We just fell in love with each other," Sebelius said. "She makes me want to be better and to do it, because if she can do it, why am I letting it stop me?